Anthony Mary did not enter the field of medicine for the love of money. Given his wealth, he was more than amply furnished; and even if that had not been the case, he would not have cared about it. From his youth, he had had the intention of leading a life of celibacy, and now, more than ever, he felt increasing in him contempt for the things of this world and a love for evangelical poverty. The principal reason he decided to study medicine was the desire to be of greater help to those around him. He thought that a doctor, animated with the spirit of Jesus Christ, could do great good for his neighbor especially at the hour of death. For while many keep aloof from the priest, either through an aversion to the minister of Christ, or through their own prejudice, the doctor always had had free access. His advice was generally listened to with respect and put into practice. In 1524, Anthony Mary returned to Cremona as a newly certified physician. It was here that he spent the next two years in a medical residency. He quickly gained a large practice. His noble birth, his affability and modesty, and his skill in his art very soon gained him the esteem and confidence of all, so much so, that although still so young, he was nominated a member of the celebrated College of Doctors, shortly before instituted by the Duke Luigi Sforza, and enriched with many privileges by the sovereign Pontiffs. His mode of treatment was, nevertheless, very different to that generally adopted by other doctors of his time. The wise doctor was convinced that all evils arise from one cause, which is, sin. In order to cure the diseases of the body, it was first necessary to cure the soul. So, as soon as he was called to the bedside of the sick, he first urged them to think of God, obtain His pardon, and receive the sacraments. To the poor, besides the consolation of his kind words and the skill of his art, he also carried generous alms. From his inheritance, he seemed only to enjoy as much as he was able to bestow in charity in order to relieve those in distress. By 1526, Cremona was in a state of emergency due to a plague. So great was Saint Anthony's concern for the sick and the poor, that the Zaccaria family mansion was converted into a charity hospital. In this way he accomplished a two-fold task, his care embracing both soul and body. But the extraordinary activity of Anthony Mary was not limited to visiting the sick. For having finished his visits to the sick, and to those in the hospitals and prisons, he would gather the children around him whom he often went himself to bring in from the streets; the carelessness of their parents had left them abandoned. With great charity and admirable patience, he taught them catechism, and the way to lead a Christian life. Father Marcello, his Dominican confessor, seeing the great good that the children of the lower classes derived from his instructions, urged him to interest himself also on behalf of the sons of the rich and noble. They were no less in need of instruction and religious training than the lower-class children. Anthony Mary, accustomed to recognize the voice of God in his ministry, began immediately to hold conferences on Sundays and holidays for young noblemen. The conferences were held in the church of St. Vitalis, afterwards called St. Geroldo, a martyr. The church, still enshrines this Saint’s ashes of the martyr, killed in 1241 near Cremona. These pious discourses were given with such a spirit of fervor and such deep learning that the youths willingly left their worldly amusements to go and listen to him. 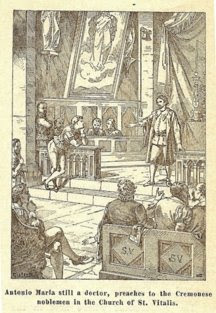 Not only these, but persons of every age and rank crowded there, wanting to hear the new missionary (though in layman's dress) who preached so powerfully by his example no less than by his words.It must, indeed, have been marvelous for the people of Cremona to see a wealthy young nobleman who, humble and forgetting himself, seemed to have at heart nothing but the spiritual welfare of his neighbor and the glory of God, of whom he spoke with such learned eloquence. His life, so pure and holy, was withdrawn from every extravagance. Content with spare and simple food, he gave up his body to mortification and his heart to the love of God.